The table shows the top 10 exports relating to food and drink. The actual value of exports for each product varies widely from year to year. The figures quoted in the table are an average of the last few years for which data are available. They underestimate the importance of strawberries, exports of which have risen sharply since 2004. In the past couple of years, exports of strawberries have exceeded watermelon in value. How many countries have featured tomatoes on a stamp? 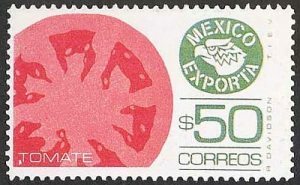 Small wonder that the “Mexico exports” set of stamps in use from the 1970s to the 1990s featured many agricultural products in its designs, including tomatoes (pictured here), tequila, beer, coffee, honey, strawberries, limes, cotton and citrus fruits. We plan to look more closely at some of these items in future posts. Agriculture is analyzed in chapter 15 of Geo-Mexico: the geography and dynamics of modern Mexico. Mexico’s exports are examined in chapter 20. Buy your copy today, so you have this handy reference guide to all aspects of Mexico’s geography available whenever you need it. I imagine that marajuana exports are near the top of the agricultural exports, but cannot find data on the dollar earnings from exports of marajuana. I guess that marajuana exports probably rival beer for the top spot. Drug trade estimates suggest Mexico earns $30 – $40 billion a year from the drug trade. I suggest that at least 10% of this, or $3-$4 billion is from marajuana exports. Yes, as you appreciate, the table only shows legal exports. Your figure for marijuana exports sounds perfectly plausible.